The main problem I had in writing this article was that I had to limit it to only seven scientific evidences that support creation over evolution. It is my contention that every scientific fact having to do with origins points to God as creator of the universe. Creation scientists believe that the observable universe we see around us points clearly to God’s hand in creation. The evolutionist does not accept the reality of God; therefore, he or she must attribute what they observe to some force other than God. The quantifiable, observable evidence is the same for both groups, creation scientists and evolutionary scientists; it is the worldview held by each of these groups that causes them to interpret that evidence differently. I eventually narrowed my article down to six scientific evidences and one Scriptural. In an article this size, I certainly will not be able to satisfy every skeptic; nevertheless, these evidences must be overcome, or overlooked, when positing the idea that the universe, or even just human beings, came about by random unguided processes of nature rather than by the direct will of a loving, all-powerful Creator-God. If all life forms have evolved from simpler life forms there should be millions (billions) of transitional fossils available for study. These transitional fossils, for example, would be of the type showing the process of one species evolving into another. However, no transitional fossils have ever been found. Geisler and Turek point out that, “…the fossil record actually lines up better with supernatural creation than with macroevolution. Indeed, there aren’t missing links—there’s a missing chain!” (Geisler and Turek, p. 152). This idea is a companion idea to the fact that we see no transitional fossils in the fossil record. Irreducible complexity says that, “…living things are filled with molecular machines that perform the numerous functions of life. These molecular machines are irreducibly complex, meaning that all the parts of each machine must be completely formed, in the right places, in the right sizes, in operation order, at the same time, for the machine to function” (Geisler and Turek, p. 145). If one part of this machine is not there, the machine does not function; therefore, evolutionism’s idea that life came about gradually, a piece at a time, is not feasible. The basic parts for life must appear in working order, and at the same time for there to be any life at all…just as the Bible declares. This idea calls into question how an organism, somewhere in the middle of the process of changing into a different organism, could survive at all. How could a fish survive if it were halfway through the process of changing from a fish to a dog, for instance? Would it have scales and fur? Gills and lungs? Fins and legs? It would be virtually impossible for an animal, partially evolved into another animal, to survive. Environmental factors and predators would end the evolutionary process quickly for these half and half animals. The Bible tells us that all living things were created perfectly in the condition God intended for them. What we see in the layers of the earth’s crust is better explained by a global flood catastrophe than by the slow, uniformitarianist theories of evolutionists. Evolutionist scientists tell us that what we view on the earth’s surface, and its crust, is the result of millions (billions) of years of slow, steady deposits of material. The layers of our planet’s outer shell are a result of a plodding process that took a very long period of time. However, there are many features that simply could not have been formed this way and actually make much more sense when attributed to the worldwide flood of Noah’s time. Studies have been done on the effects of the Mt. St. Helen’s eruption on May 18, 1980, that show that landscapes similar to what we see in the Grand Canyon could have been formed in mere minutes instead of thousands, millions, or billions, of years. 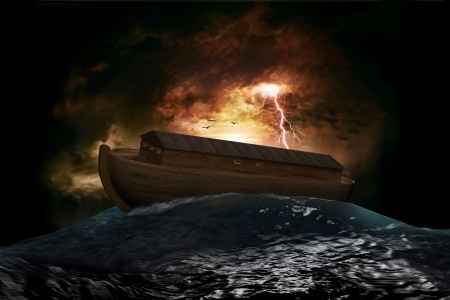 In other words, there is no reason at all to doubt the biblical record of creation and Noah’s worldwide flood. The theory of evolution relies on the idea that things can improve, or become more complex, given enough time. However, what we observe is that everything runs down or becomes less complex. This is called the Second Law of Thermodynamics or the Law of Entropy. For evolution to work, this law would have to work in reverse; new information would have to be added to the existing organism in order for it to improve, or increase in complexity. We do not see this in observable science. However, the biblical record of Creation (and the theory of creation science) explains everything we see around us in the observable world. Methods for dating rocks are based on assumptions. Therefore, if one (or some) of these assumptions are incorrect, then the date of the rock being tested will be incorrect. Those who believe in evolution also believe that the processes we observe now, physical and chemical processes, have always occurred at the rate that they are presently occurring. Thus, they claim to be able to tell how old something is by calculations based on that belief. However, there is no way to verify this uniformity they espouse. A worldwide catastrophe, such as the flood of Noah, would completely upset this uniformity by which they gauge the passage of time. Therefore, the dating methods used by these naturalistic scientists is based on unprovable assumptions, not observable facts. There was only one being who observed Creation; this same being was the One who did the creating and recorded it in the first chapters of His Word. Evolution is not observable or falsifiable; therefore, it is not science. It is a philosophy of origins. “The question of origins—creation or evolution—is almost entirely outside the experimental domain of science” (Morris, p. 53). Therefore, if creation (theories of origins) is not scientifically observable or testable, we must get our knowledge of creation from another source. The Bible tells us that God created the universe, “In the beginning, God created the heavens and the earth” (Genesis 1:1 ESV). When this statement is accepted, all scientific problems concerning our origins vanish. There are no problems with transitional fossils, irreducible complexity, the viability of transitional forms, the geological features of the earth’s surface, or dating methods based on faulty assumptions when we simply believe the biblical record we have been given by the Creator. Read this related article: Can Creationism and Evolution Co-Exist? Norman L. Geisler and Frank Turek, I Don’t Have Enough Faith to be an Atheist. Crossway Books, 2004. Henry Morris III, Exploring the Evidence for Creation. Harvest House Publishers, 2009. The science behind the theories of evolution are no where near settled. Every day new scientists come out with their theories on how they think things were created. However we Christians also need to open our eyes to differing possibilities of how God created the earth and the timeframe in which he did it in. The fact of the matter is no one really knows. The Bible does not clearly describe all of the methods of creation and science does not even come close to coming to a consensus on how they think things came to be. Maybe we both are right or maybe we are all wrong together. Truth is truth both spiritual and physical. Gods laws are eternal and unchanging. Are the laws of sciences also part of Gods natural laws? Maybe God did use his natural laws to evolve certain things and to create or organize others. There are many things from God that man can not comprehend. Is this not one of them. 2 Peter3:8 But, beloved, be not ignorant of this one thing, that one day is with the Lord as a thousand years, and a thousand years as one day. Could God have created everything in a 7 days? I believe he could. But could he have also set things in motion and let certain natural processes do much of the work as well? I believe that could be very plausible as well. I think we as Christians need to work on building some of these bridges instead of constantly burning them down. Our persistent hardline in the actual 7 day creation period and a full ignorance of the science that could have truth within its theories, only fuels those fires and prevents many of the willing from accepting the spiritual side of Gods all-knowing laws. Thanks for reading and commenting. I appreciate your thoughts on this subject. May God bless you richly. Kevin, thanks for being so gracious in your disagreement with what Robert wrote. Let me ask you this sir and if the author allows me, Robert Driskell, let me say that if you could ask Jesus about evolution, would He say He believed in it? You can find His answer in the scriptures. It is clearly obvious that Jesus did not believe in evolution and if you can believe in Jesus, which I do, then let His words prove it to you. Don’t believe me, believe what Jesus says for in Matthew 19:4-6, He answers the question about divorce from the Pharisees saying, “4 And He answered and said, “Have you not read that He who created them from the beginning made them male and female, and said, ‘For this reason a man shall leave his father and mother and be joined to his wife, and the two shall become one flesh? ‘ So they are no longer two, but one flesh. What therefore God has joined together let no man separate.” So God did not create amoebas after the amoeba kind or single-celled creatures after the single-celled creature kinds. If God did allow natural processes to be used, why did Jesus quote Genesis in Matthew 19? “As in the days of Noah, so shall also be the coming of the Son of Man be” so it is apparent that Jesus did believe in the story of Noah’s Ark and thus, by extension, the Global Flood. Do you believe sir in the archeological evidence that a great, worldwide flood occurred? In Matthew 12 some of the scribes and Pharisees said to him, “Teacher, we wish to see a sign from you.” He said to them in reply, “An evil and unfaithful generation seeks a sign, but no sign will be given it except the sign of Jonah the prophet. Just as Jonah was in the belly of a great fish three days and three nights, so will the Son of Man be in the heart of the earth three days and three nights. Jesus speaks of Jonah and this necessarily included him being swallowed by a “great fish”, not a whale as is supposed and which is not in the original Hebrew. So Jesus certainly believed this to be true and not a mythological story or an analytical piece of literary work. Of course a Christian’s salvation does not depend upon whether he or she believes in evolution or not, but whether he or she believes in Jesus Christ (Acts 4:12). Evolution and Jesus words are not compatible with evolution. God is Creator and He didn’t use happenstance or random events. By the way the words for “day” and “night” are cyclical, calendar days in the original Hebrew language in Genesis and Peter’s quote is a metaphor that God that time is inconsequential to God. Peter was quoting the Psalmist in 90:4 and he was speaking about the impending judgment coming on mankind, and not on the creation. The quote from Psalm 90:4 was in proper context when Peter took it from the Psalms as Psalms was taking about judgment as well and not the creation or the earth itself at all (90) and although he mentions God as Creator, the context is about mankind and mankind being like a vapor and the graves swiftly come upon us all. Do you see that sir? Just thinking about what you said. TO believe that God created using evolution makes Jesus’ words make no sense at all in Matthew 19 makes God into a “deist” God or “hands off” God but God upholds the heavens and the earth and for Him to use times, space, chance, robs Him of glory, in my opinion. Make sense sir? Thanks for letting me reply. Amen Robert…what people also fail to understand is that the Bible is not a science textbook, it is a book about having a relationship with Christ and to be restored from our being separated from Him by our sins. It is not a book about the heavens but a book about how to get there. I love your point Robert about trying to interpret the bible from their reliance on science instead, as you so aptly stated, let the Bible interpret what we see around us. Science changes, facts are proven wrong…the Bible? Never! I really enjoyed this article. Atheists will never admit it, but evolution is not science, it is only a philosophy. Thank for the replies. I am sorry if I came across as being disagreeable. I definitely do not believe in the theory of evolution. I do not believe that we evolved from apes or that life began at the bottom of the ocean, or came from lightning. Like I said there are new theories every day on how life began. But that is all they are Theories. not fact. The point I was trying to make was on the actual time that it took. Is Gods time the same as mans time? They called it a day but who’s day was it? God time is from everlasting to everlasting and our 24 hour day is but a mere drop in the ocean when compared to that. I am interested in you thoughts on that. It’s often difficult to hear the ‘tone’ of one’s words in an email or written comment, so let me assure you that there is only love coming from those who write for this site. I didn’t find you disagreeable at all…this section is for commenting, and that’s what you did. We welcome your input, brother. Now, my thoughts on creation week: if it weren’t for the dating methods of the secular scientific community (see DATING METHODS FLAWED above), it is clear that a straightforward reading of Genesis portrays God creating the universe in a week (six days actually). He could have done it in a milisecond, He could have done it in a gazillion years, but it ‘says’ He did it in a week (‘evening and morning’ are stressed for each day mentioned). I know this debate has raged for a long time, and probably will continue, but this is what I am convinced of, that is where I stand. Thanks again, Kevin. God bless you. Thanks Robert. I am not saying which way is right either. Like you said, God could have created everything in a millisecond or a gazillion years. I believe there is evidence in the Bible to see it one way or the other. There are holes in the science based method of determining how the earth came to be but it is not all false. Throwing all of the science out only stands to alienate a large portion of the population who simply see it as truth. 50 years ago most scientists were strong Christians but now a days I would say most seem to have an atheistic persuasion because of our Biblical interpretation that the earth is only 6000 years old. Our mission shouldn’t be throwing out stumbling blocks, preventing people from believing in Christ and his gospel. Our mission needs to be open in bringing all people unto Christ so that they may have a chance at salvation. I would like to clarify my position on science. True science is a wonderful thing; it has made many life-saving, life-prolonging, life-improving discoveries, inventions, and technology. I would never say that science, in and of itself is bad. However, like anything else, it is something that can be abused. I believe that it is being abused when it is used as evidence against Creation by a holy God. Many evolutionists I speak with take the position that science has ‘proven’ that the universe came about without any supernatural agent at all; therefore, they believe that ‘science’ has ‘proven’ that God did not create the universe. How do we agree with them on that? We can’t. I must disagree with your statement, “I would say most seem to have an atheistic persuasion because of our Biblical interpretation that the earth is only 6000 years old”. Many of those to whom I correspond don’t just have a problem with the age of the earth, but with how it came about in the first place. Let just say for a moment that we agree with them that the earth is billions of years old (or however old they want us to accept); now we come to the other miracles of the Bible. They don’t believe these could have happened either (because their idea of science says these miracles can’t happen). Must we also agree with them on this also? Did Jesus turn water into wine, heal the blind and sick, raise the dead, or not? Science says ‘no’. What does the Bible say? Then we come to the resurrection. Science says people don’t come back from being dead 3 days. The Bible says that Jesus did. Which is it? I want to build bridges to the lost, scientists and non-scientists alike, but I will not trade my trust in God’s Word for the theories of those who deny Him. There are Christians who disagree about the age of the earth, but if you believe the Bible, you can’t believe that God did not create it. I only have a problem with the science (and scientists) that seeks to ‘prove’ that God did not create the universe; I certainly do not think we need to stop all science and bury our heads in the sand…too much good has come from research. However, that research should lead us to a stronger faith in God, not a denial of His very existence. Anyway, that’s the basis for my position. I respect yours also (I certainly do not have all the answers nailed down). I just wanted to try to explain my thought process on this. God bless you, Kevin. Keep the faith. Wow, I would like to commend everyone here for such a civil discourse. I spend much of my time debating with evolutionists…old earth proponents(OEP), both theists and atheists. I think Robert, Jack and Kevin have made excellent points. My training is in evolutionary biology with my specialty in cellular biology. I was trained by some of the most preeminent names in the field of Evolutionary Biology only 23 years after Watson and Crick discovered the double helix nature of DNA. I hear Kevin’s complaint and totally agree that Christians can become informed on the science. I totally “get” those Christians who do not want to become informed on the science and are happy with “God says it and I believe it”. Amen, I can’t argue. Here is a resource I have mentioned before. Left hand side of their home page…click “Search”, then “Archives”. For those with a less technical bent go down the center page and click on “Origin Issues” or “Creation Issues”. Those of a more tech. bent click on “List of technical Papers”. Many other resources exist, but ICR is a gem who has been scientifically refuting OEP for years. I love it! The more you research the more it becomes clear that the earth suffered cataclysmic disasters in the past and that we are indeed a young planet (Less than 10,000 years old). Enjoy! I’ve enjoyed the conversation! Great point Doc. I believe that when God created the heavens and the earth that He created a mature universe. That is the earth was made as to appear in an already mature state….not that God did this to try and prove anything like a young universe but my point is that when God created Adam and Eve, they were adults and were to be fruitful and multiply and fill the earth. The Garden was already bearing fruit and so on. See my point? The earth had the appearance of being mature with already mature plants and animals and so it is not inconceivable that He would also create an earth that looked like it had been there for a while. Anyway, thanks Kevin and Doc for contributing to this fine article by Robert. ICR is a great site, as is Answers in Genesis. I am constantly reminded that the creation/evolution discussion is not about differing facts, but about the differing interpretation of those facts and the differing worldviews fueling the differing interpretations. God bless you. Agree Robert! There is usually a “work around” by both sides of the issue to support their particular worldview. Two of the most laughable to me on the old earther side is “Given enough time anything is possible”, and the other is the Ort Cloud “somewhere out there” spinning off all of these new comets of late. Obviously, a topic that could use a lot more words, but a great overview. Thanks! It’s been a few weeks now since I have added anything to my thoughts. I have come to the conclusion, that having faith in God is the only answer. Nothing else makes sense to me. As I have mentioned before, all the bodily functions just couldn’t happen by evolution. All the body parts, muscles, nerves, joints, heart, liver, kidneys, prostate, blood flow, the digestive system, that are necessary for us to survive had to come from God. It is hard to comprehend where it all started, but one thing for sure, you can’t create something out of nothing. When a person keeps asking the questions, how did that happen, where did that come from, and all the whys and hows, you eventually determine that at some point, there was nothing. How did the universe come to be? How large is the universe, why is it necessary? We have to imagine ourselves leaving earth and traveling out in space far enough until there is nothing. What’s after nothing? Is it possible that the universe has always been, and if so how did it come to pass. At some point there has to be nothing, and only one entity can create something from nothing, and that’s God. There is no other explanation. The human brain just can’t comprehend that at one time there was absolutely nothing. Nothing had to be created into something. Creation is the only answer and that answer is God. Atheists, agnostics will claim it’s evolution, but if there was a void, then nothing could evolve, because there is nothing to evolve from. I can’t tell you how my heart rejoices over your comments. God is truly wonderful. If only more people would soften their hearts, and heads, and worship the Creator of this truly incredible universe. God bless you, brother. I LOVE THIS !!! OUR FAITH MAKES US KNOW WE DON’T NEEDS MAN’S FINDINGS TO BELIEVE , BUT IT SURE SHOULD MAKE A NON-BELIEVER TO CONSIDER READING THE WORD OF GOD , AND REALIZE ONCE AND FOR ALL GOD CREATED ALL !! , AND THE BIBLE IS ALL TRUE !! Evolutionists often have answers ready for the points I’ve mentioned in this article; however, they have never made more sense to me (scientific or otherwise) than the clear teaching of the Bible…that God created everything. God bless you brother. ROBERT , WHAT ABOUT ELOHIM ? I’m not sure what your question is here. Could you elaborate? i HEARD A PREACHER , HIS NAME SLIPS MY MIND RIGHT THIS SECOND , HE REFERRED TO ELOHIM AS GOD KNOWING WHAT HE WANTED T CREATE AND JUST MAKING IT HAPPEN , I HEARD ANOTHER PREACHER SAY A FELLOW WAS SAYING I CAN DO WHAT GOD DID MAKING A MAN FROM SOIL AND HE REACHED DOWN TO GET A HAND-FULL AND HE SAID WAIT MAKE YOUR OWN DIRT , LOL . WHAT DO YOU THINK OF THE FOLLOWING AND IF YOU HAVE THE TIME LOOK INTO THE GREEK WORD ELOHIM : WE HAVE A SINGLE ALL POWERFUL GOD — HIS CREATION WAS IN REMARKABLE ORDER , — THE BIBLE DOESN’T SAY HOW LONG OF A TIME PERIODS WERE — THE REAL QUESTION , HOWEVER IS NOT HOW LONG BUT RATHER HOW HE DID IT — IT BEING IN SUCH AN ORDERLY FASHION — LIKE THE HEAVENS AND EARTH , SKY AND WATERS , LAND AND SEA AND VEGETATION , THE SUN AND MOON , AND STARS , THE BIRDS AND FISH , THE ANIMALS AND HUMANKIND , THEN HE RESTED , HIS WHOLE PLAN AND IT WRITTEN IN HIS WORD , IT IS SO WONDERFUL , AND I THINK TOO HE DID ALL THIS OUT OF LOVE FOR US ………. , IF I THINK OF THE PREACHER THAT REFERRED TO ELOHIM I WILL LET YOU KNOW — I’M NOT SURE HOW THIS WAS EXPRESSED EXACTLY , THANKS ROBERT …….. It appears that several different names were used for God in the Old Testament. The different names reflected the different relationships between God and His creation, God and His people, and God and the rest of the world. A word study on the names of God is a fascinating study. I did one many, many years ago and I still rememeber being awed by how God revealed (and reveals) Himself to humanity. God bless you. Yes, I’ve heard of him. I have a couple of his books too. He’s a pastor in the Dallas, TX area. As far as I know, He’s solid on the essentials of the Christian faith. Robert , I have accrued 143.3 days of vacation over what I can carry over to next year and my supervisor just says over and over that she loses too , and doesn’t seem to care if I get any time off , but else she takes time off all the time , is this not cruel to do an employee this way . I have holiday comp time of 49.5 as well , the Obama Care and the opening of a new campus caused a great deal of this , all the employees we have are part time and their hours had to be lowered , plus they were forced to take time off so they were not over what the company could allow to keep from offering insurances . It seems that all suffer except for the one’s in charge are in the click who can get what they want or ask for while others are shunned when they ask for their earned time . I think this is no more than a legal and maybe illegal way to cheat folk , and if you blow the whistle you lose in the long run as well . I truly think that people who do this will answer to GOD . The supervisor says they lose their time too every year but I am never out sick , in 4 years I haven’t been out and never recognized for that , and I had asked for days since July and was refused everytime but else this supervisor took 2 weeks off back to back . I read James 5 :4 , do you know of other verses that explain this . I too have noticed the trend of many of those in power who could care less for those whom they consider to be inferior to them. There are many injustices in the world today, both small and large; injustices to individuals and people groups. But why would we expect any different from a world system that rejects God and His moral standard? As believers, we recognize that this world (which was created perfect) and its system, is no longer the perfect place that God made in the beginning. Romans 8:22 tells us that, “… we know that the whole creation has been groaning together in the pains of childbirth until now” (ESV). Our reaction to this skewed world system is what sets us apart from those who do not consider Jesus their Lord and Savior. We trust Him in all circumstances. We know He loves us and, if we are faithful in our relationship to Him, He promises to see us through any hardship or circumstance we may encounter. Paul, who suffered much for his faith, realized that we will go through times of trouble here on earth, but he trusted God and wrote this, “For I consider that the sufferings of this present time are not worth comparing with the glory that is to be revealed to us” (Romans 8:18 ESV). Nicholas, let me encourage you to focus on God and His love and goodness as you deal with this issue. God will not let you down; although people often will. We are to give thanks in all circumstances (I Thessalonians 5:18). James 1:2-3 tells us to, “Count it all joy, my brothers, when you meet trials of various kinds, for you know that the testing of your faith produces steadfastness” (ESV). God is bigger than anything you will ever face; trust Him (and pray for your employers). God bless you, brother. Thanks for the great article! I will surely use what I’ve learned from this as an antithesis against the evoloution taught in my school. In fact, my biology teacher is a Christian who herself doesn’t believe in evolution so I’m sure that these arguments will be welcome in her class. Once again, thanks. God bless. Tate, I would look at the historical context of this verse. The Corinthian church had come out of pagan, woman prostitute priests and they may have been carrying this over into the church. I do not think that it is sexists at all. God elevated the status of women. Just look at the examples of Jesus speaking to and healing women and for Jews and even the Greeks and the Romans, they regarded women as property and not people. I suggest you read the John McArthur Bible study commentary on this.